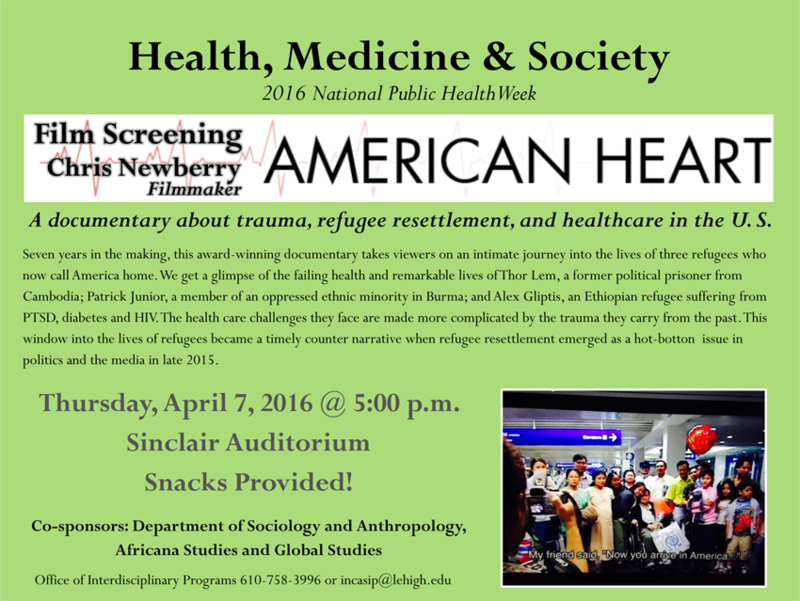 American Heart is a documentary about trauma, refugee resettlement, and healthcare in the U. S. Seven years in the making, this award-winning documentary takes viewers on an intimate journey into the lives of three refugees who now call America home. We get a glimpse of the failing health and remarkable lives of Thor Lem, a former political prisoner from Cambodia; Patrick Junior, a member of an oppressed ethnic minority in Burma; and Alex Gliptis, an Ethiopian refugee suffering from PTSD, diabetes and HIV. The health care challenges they face are made more complicated by the trauma they carry from the past. This window into the lives of refugees became a timely counter narrative when refugee resettlement emerged as a hot-button issue in politics and the media in late 2015. Question and Answer period following with Chris Newberry, filmmaker. Co-sponsors:Department of Sociology and Anthropology, Global Studies and Africana Studies.